One day this little strip will grow up to be a comfy throw! the yarn. 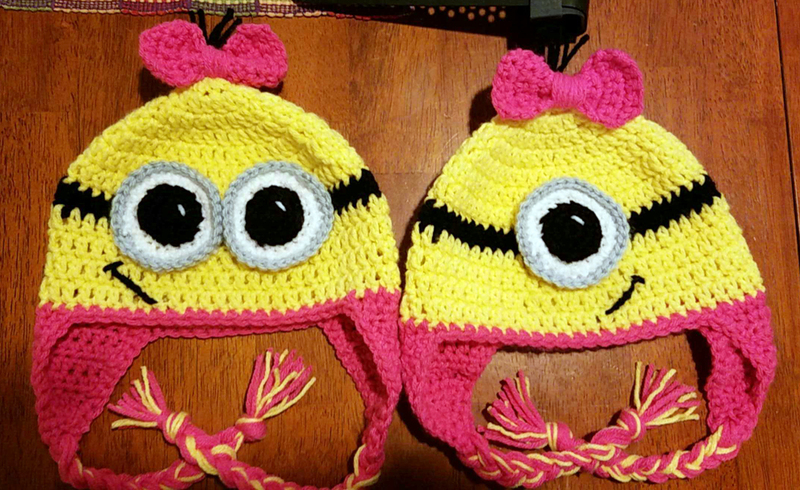 While I was making the Halloween Purse, I got a special request for some minion hats for Halloween. Didn’t have a pattern, and since it was for my niece’s daughters, I threw in the pink. Real simple. And now, I’ve taken up my very first knitted blanket project. Knitted, not crocheted. I’ve made plenty of crocheted blankets because it just goes faster, but this is thicker yarn and I’m hopeful it will be done before Thanksgiving. We’ll see. somewhere onto a knit baby blanket. 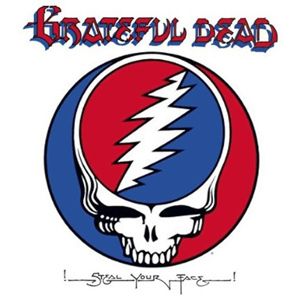 Not the writing, just the skull and circle. Now how am I going to do that? Any experienced stranders out there? Or am I just going to need to do duplicate stitching? I have two other friends that are expecting, but not as far along, so, hopefully, I’ll be finished with this in time for their baby showers! Any and all suggestions for the skull head would be greatly appreciated. 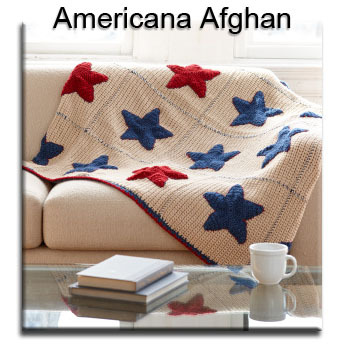 Is Anyone Up for an Afghan Crochet-A-Long? 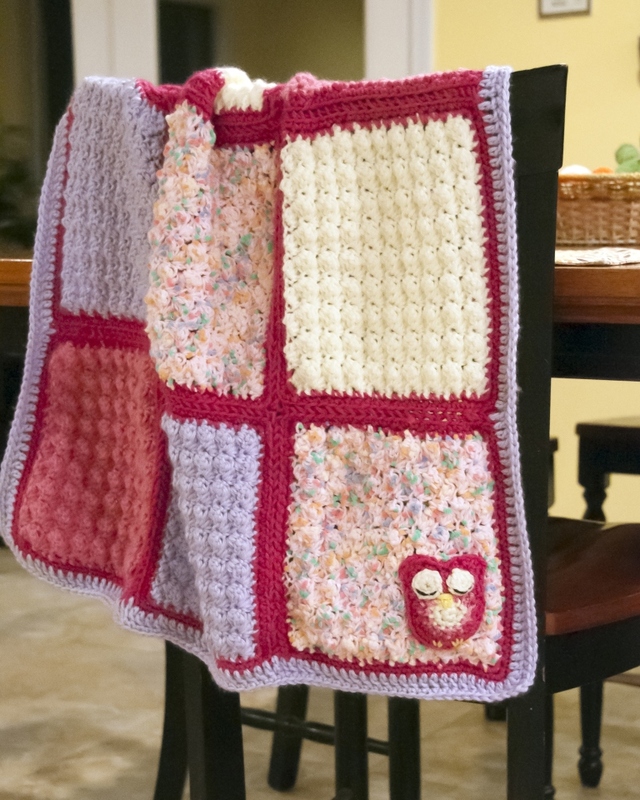 I don’t know if it’s me, but I’ve been in the mood for fairly simple projects, and this one really looks like a blanket I could use pretty much throughout the year. I’m looking for some company with this one because it may be a bit tedious getting through all those easy steps – LOL! I know, I know, I said I wanted simple, I’ve got it, and it now it may be too much. Well, you all know what it’s like making an afghan, and if you don’t, join me! It’s very gratifying when it’s done and you have a useful item for around the house. And let’s not forget about the ooh’s and ah’s to assuage your ego that you will inevitably get when you casually throw this over the back of your chair at work or drape it over your neighbor’s fence to “air” it out. The schedule for this would probably be the month of August. Don’t roll your eyes! 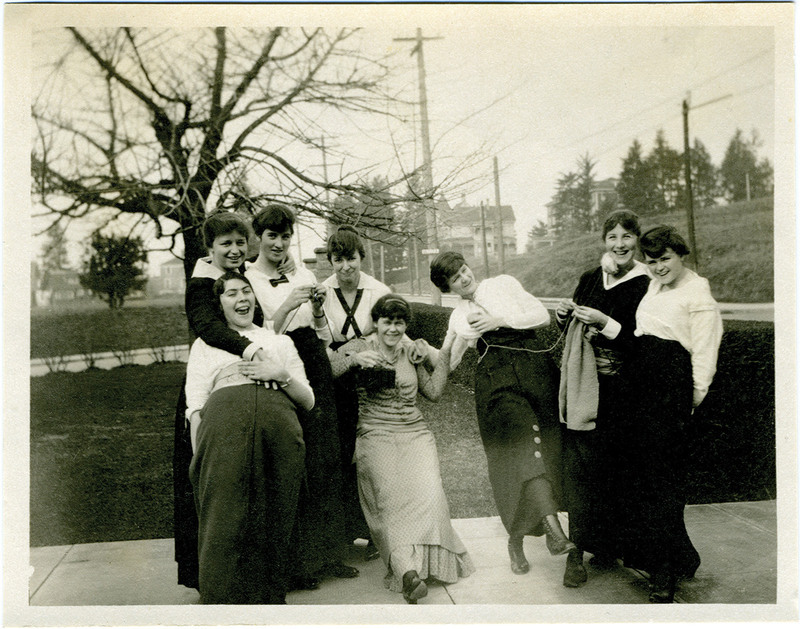 When you see the pattern you’ll see this is done in piecework, and it doesn’t come together until the end. Use the thick blanket on your legs during the hottest part of the summer as motivation to finish. Good idea, right? I want to hear from interested parties, so don’t be shy! I’ve got Halloween on my mind, and I can’t be the only one. I know, I know, we should be working on our Christmas gifts, but I would like to squeeze in a Halloween project. Something we can do together. And be done with in…oh…a month. So you could have plenty of time to return to your Christmas gifts, or get them started. I’d like to get this started as soon as possible, so we could all enjoy the blanket for awhile before having to pack it away with all the other Halloween decorations to await next year! 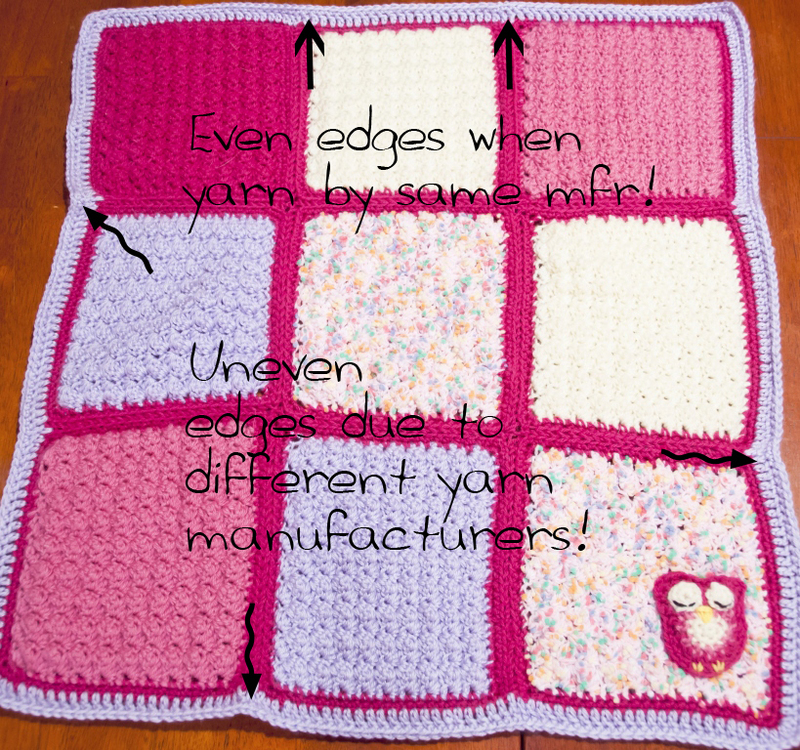 As this is worked with Red Heart’s Super Saver yarn, so this will definitely be easy on the pocket! I shall be starting on Friday, September 5th, and I’ll be keeping you posted of my progress. If you decide to join, definitely write about your progress and upload those pics! It can be so motivating when the “doldrums” kick in. Click on the picture to go to the pattern instructions. Some boo-boos that I had to hazard because I loved all the yarns I used. I finished my niece’s baby blanket in time for the visit! I have used a kit modeler’s term “kit-bashed”, meaning to put a model together using pieces from other kits because it really fits with this quickie project (can we say “kit” one more time?). I personalized the colors from a very simple pattern at Lionbrand.com, added a border of my own making to go around each individual square and then again around the whole blanket, then snagged a cute owl applique from Laura Maxell’s blog and made some small revisions on that (see the feet and eyes!) 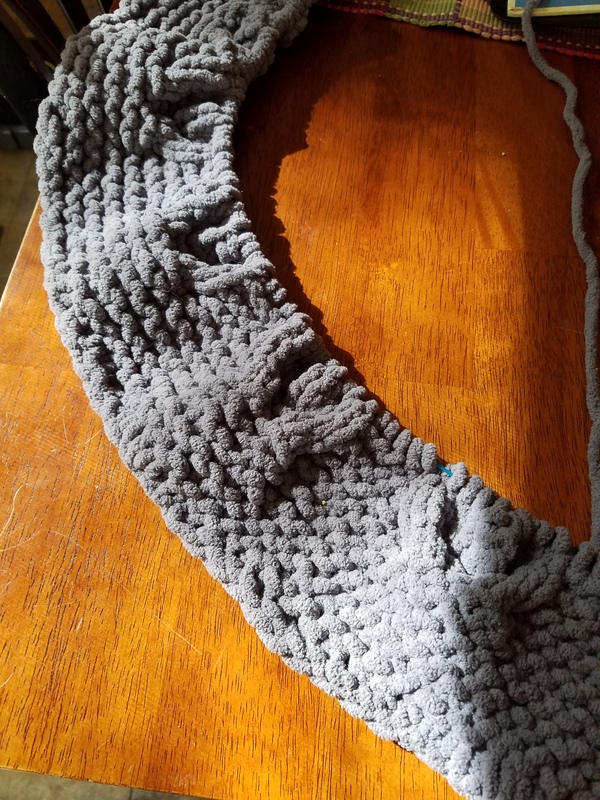 All in all, it was easy to do; however, the yarn colors I wanted were not all from the same manufacturer and I really wanted the colors/texture of the other yarns, so I took that chance. As you can see, the squares were not as symmetrical as I would have liked, but I believe it was worth it, especially when I saw my niece see it in person (she follows my Facebook page!). All’s well that ends well! What have you guys been working on?